So my friend Tamara posted a little gem on her twitter about the "best miniature animals to have as pets." Number one? I guess my obsession with pigs stems from my mom incessantly playing "Charlotte's Web" for me (and calling me her "Magnum Opus") or my Aunt Bonnie who also had a huge thing for pigs. She had weird little pig statues in her townhouse and I remember frequently climbing up a flight up stairs and seeing a huge ceramic pig who we obviously named Wilbur. 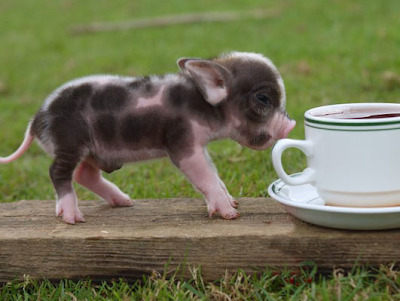 This pig is actually called a "Micro Pig" and it's comperable to a purse puppy! Presh, is it not? It might need another micro piggie for a friend and definitely needs a garden. Two pigs are better than one (in my opinion) and this is a great excuse to get me to find a home where I can start off a new gardening hobby. They grow to be 65 pounds and 14 inches long.